We’ve all done it. We’re watching a movie or a TV show and someone appears who seems familiar. We point at the screen, turn to our friends and say “oh, it’s him…it’s…that guy, who was in that thing.” It’s easy to take for granted the performances we see on the screen, big or small. For a couple of hours we experience the escapism that fiction affords us and when we’re finished we go on with our lives. While we appreciate the work of the actors, their paths to the roles they bring to life are rarely considered and for many it is the culmination of many years of heartache and disappointment. 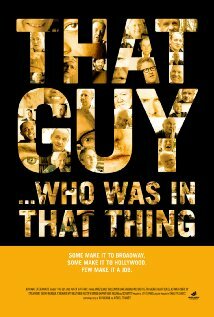 In 2012, directors Michael Schwartz and Ian Roumain released the documentary “That Guy…Who Was In That Thing” with the purpose of opening our eyes to how 16 actors, who are seen in roles on a regular basis, experience the extreme highs and extreme lows of trying to build a career in Hollywood. I was unsure what to expect when I started watching it. There was definitely a feeling of lightheartedness, enhanced by the often cheerful soundtrack and the comedic commentary of many of the actors. As the documentary progressed, however, the true subject matter revealed itself and I quickly found myself engrossed as I listened to the sometimes unbelievable sacrifices these actors had made to pursue their passion. One of the first facts that flashed across the screen was that SAG and AFTRA represents over 240,000 actors in the US. The average annual income is less than $5000. Despite being aware of that statistic, Zeljko Ivanek said that he never felt he had a choice about what career path he should follow. He could choose the schooling he pursued and the jobs he took to try and fulfill his dream, but he was destined to be an actor. Many of these men were raised by parents who were not involved in the entertainment industry. While they received support for the most part, some, such as Rick Worthy, talked of the disappointment they encountered when it became clear they were not going to be swayed from the path they had chosen. Character actors can be anything. They can be the bad guys, the good guys, a kindly neighbor; they are billed as someone who moves the story along and within that purview they are apt to be typecast. While this comes with trappings there is also the opinion that the only thing worse than being typecast is not being cast! As this dilemma was discussed at length, the documentary managed to highlight the range and versatility of these actors. As their numerous credits were shown I was astounded by the variety of roles and genres in which they have showcased their talents. W Morgan Sheppard stated that he felt luckier than the stars because of the range of work that is available to him. Schwartz and Roumain did a wonderful job of using footage of Hollywood to compliment the mood of the film; a rain-drenched beach under a grey sky when failure was being discussed, a palm tree under the blazing sun to represent success. As each of the actors talked of the dichotomy between the tedium and terror of the audition process and the ecstasy felt when success is achieved I realized that this film should be required viewing for any aspiring actor. There was an aspect of hope to every story, a conviction that the path they had chosen was the right one. What struck me most as I watched this fascinating documentary was the willingness of the subjects to be completely honest about the lives they lead. Seeing Rick Worthy break down as he spoke of his thoughts of suicide or hearing JC Mackenzie’s openness about his financial woes while also showing him spending time with his young son gave these men an accessibility that was crucial in helping us understand the purpose of the movie. These were men who knew going in what a struggle their career choice could be, who have stuck with it through rough times, accepting their role as a character actor, a journeyman. The passion they exhibit for their art has made them endure the constant struggles and I, for one, have a new-found appreciation for their performances; I will no longer see them as “that guy…”. That Guy…Who Was In That Thing is currently showing on Showtime, Hulu and Netflix.